You have seen the listings of other homes in the neighborhood. The ones with the best pictures really stand out, making buyers much more excited about the property. You also know that bad photos make your home look less appealing, but how do you take great photos? With these six real estate photography tips, you can learn how to take the best photos to use to sell your home. Although you may want to start taking photos of your home before you are finished staging it, these are tasks that must be done one after the other. The majority of home buyers do some shopping online before they actually make a path to your door, according to a survey from the National Association of Realtors. What they see in your online listing may encourage or dissuade them. Carefully stage each room before you take your final photos. Do not be afraid to re-shoot a room if you think that the design did not come off flatteringly, or if you realize there is too much clutter. Having great lighting is absolutely paramount. A room that appears too dark seems smaller, and will make buyers wonder if they will be able to adequately light the space. Experts recommend using natural light whenever possible. Turn off the camera’s flash, as it can make surfaces look overemphasized or, conversely, washed out. Determine the best time of day to get the most natural light in each room, and use that time to take the photos. This may require you to take some informal pictures in the days prior to your planned shoot, just to give you a sense of the best lighting. There are many ways to take pictures of the property, and you should try several of them. If you are accustomed to pointing directly at the front of the home’s exterior, you may miss an important opportunity. Homes that are photographed straight from the front can lack depth. This can become a problem if the front face of the house is the smaller side, because it will make your entire home appear much smaller. Be sure to avoid snapping a nearby telephone pole or other unnecessary aspects of the property, because it may distract from your home. Strike a balance of the home with any exterior structures or trees, so that the photo does not show that there is too much going on at one side. Once you have spent time packing up and staging your home, the last thing you may want to do is spend hours trying to get the perfect shots. However, you also know that good photos drive buyers to your door, while bad photos may ensure they never come. Use a tripod to confirm a steady picture. Set the tripod lower to the ground to make the space appear larger, and to better catch the unique features of walls and ceiling. Confirm that the camera is set level with the floor, so that clean lines show perfectly horizontal or vertical. Take pictures of rooms from various angles, and start by positioning the camera just inside the door. Professional photographers may take hundreds of photographs during a shoot, and you should, too. There are many reasons that real estate photos come out wrong, and it is easier to determine what happened when you have a lot of options to consider. As you progress through the shoot, take the time to look at the photos so that you know you are getting the shots you want. This will help you to identify possible problems that you may be able to solve before packing away all the equipment. Selling a home is an expensive process. You pay to hire a real estate agent and maybe staging consultants to help you sell your home quickly. 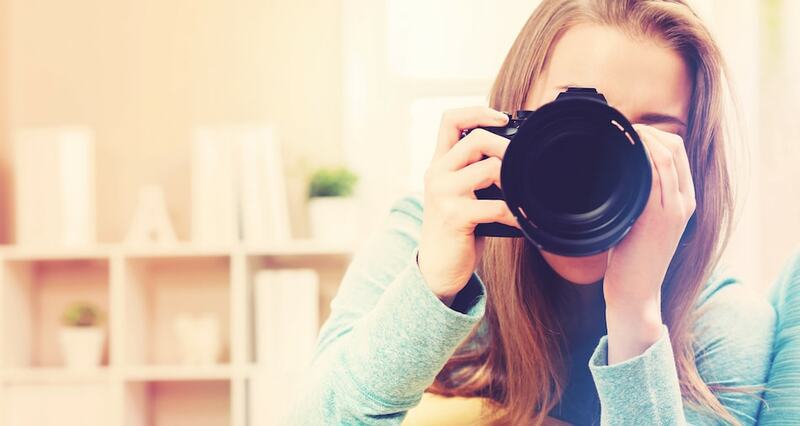 Hiring a professional photographer to take your real estate photos may help you sell your home as much as 50 percent faster. You can trust that a professional photographer has better equipment than you, but the real benefit comes in the photographer’s skill. Photographers know about the perfect angles needed for each room and can eliminate a lot of the guesswork for you. If you feel like you may not be able to get the right photos on your own, ask your real estate agent for a referral to one or two photographers with whom they enjoy working. Once you are ready to take photographs of your home for sale, you know that you are so close to making it available. When you follow these six real estate photography tips, you save time and make your home easier to sell.